Kids Enjoying the Lower Saluda near Columbia. We need your help to preserve this for future generations. This site provides information and serves as a forum to exchange ideas about the upcoming relicensing of the Saluda Hydro Electric Project. 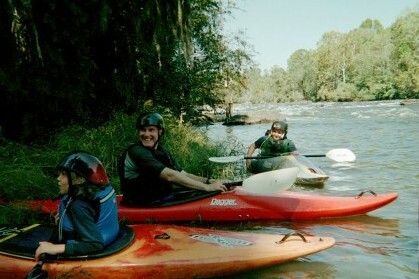 It is critical for people interested in maintaining Saluda River flows for kayaking, rafting, fishing, and water quality below the Lake Murray Dam get involved in the FERC relicensing process. You can see from the proposed partnership documents discussed below that the pressure to maintain lake levels will be intense. The relicensing is the time to act. How to Monitor FERC Proceedings through the Federal Register and the FERC RIMS and CIPS sites. How to Comment on FERC filings by paper and e-filings. Help Get the Sewage Out of the Saluda! For suggestions and comments about this site, my name is Parkin Hunter and you can email me. This site will be expanded as more information becomes available. For more information about South Carolina rivers, see my home page.